Acrylamide is a chemical that naturally forms in starchy food products during high-temperature cooking, including frying, baking, roasting and also industrial processing, at +120°C and low moisture. The main chemical process that causes this is known as the Maillard Reaction; it is the same reaction that ‘browns’ food and affects its taste. Acrylamide forms from sugars and amino acids (mainly one called asparagine) that are naturally present in many foods. Acrylamide is found in products such as potato crisps, French fries, bread, biscuits and coffee. It was first detected in foods in April 2002 although it is likely that it has been present in food since cooking began. Acrylamide also has many non-food industrial uses and is present in tobacco smoke. On 4 June 2015, EFSA published its first full risk assessment of acrylamide in food. Experts from EFSA’s Panel on Contaminants in the Food Chain (CONTAM) reconfirmed previous evaluations that acrylamide in food potentially increases the risk of developing cancer for consumers in all age groups. Evidence from animal studies shows that acrylamide and its metabolite glycidamide are genotoxic and carcinogenic: they damage DNA and cause cancer. Evidence from human studies that dietary exposure to acrylamide causes cancer is currently limited and inconclusive. Since acrylamide is present in a wide range of everyday foods, this health concern applies to all consumers but children are the most exposed age group on a body weight basis. The most important food groups contributing to acrylamide exposure are fried potato products, coffee, biscuits, crackers, crisp bread and soft bread. EFSA prepared a non-technical summary of its scientific opinion for ease of understanding. Publication of the opinion followed an extensive public consultation process that helped EFSA’s experts to fine-tune their scientific opinion and integrate recent studies (up to March 2015) into the final scientific opinion. EFSA’s scientific advice will inform EU and national decision-makers when weighing up possible measures for further reducing consumer exposure to acrylamide in food. These may include, for example, advice on eating habits and home-cooking, or controls on commercial food production; however, EFSA plays no direct role in deciding such measures. 2015 – EFSA publishes its first full risk assessment of acrylamide in food, which experts conclude potentially increases the risk of developing cancer for consumers in all age groups. 2014 – Together with national partners in the Member States, EFSA published an infographic on acrylamide in food to help increase awareness about this issue. 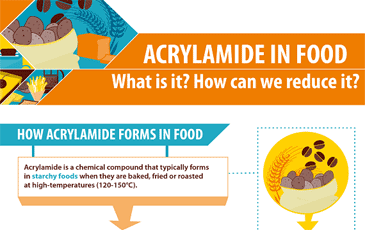 The infographic explains how acrylamide forms and in which foods, and includes basic tips provided by national authorities on reducing acrylamide exposure in the diet. 2014 – EFSA provisionally completed its full risk assessment and publicly consulted on its draft scientific opinion. The Authority held a follow up meeting with stakeholders to discuss feedback received during the online consultation. 2013 – EFSA accepted a request from the European Commission to provide a scientific opinion on the potential risks for human health of acrylamide in food. EFSA’s experts identified hundreds of scientific studies to consider for the Authority’s first full risk assessment of acrylamide. As part of its full risk assessment, EFSA also updated its European exposure assessment (last carried out in 2011) based on more recent data on acrylamide levels in food. 2013 – EFSA launched a call to food business operators and other stakeholders to submit additional analytical data on acrylamide levels in foods and beverages collected from 2010 onwards. The Authority has also consulted consumer organisations, NGOs and the food industry through its Stakeholder Consultative Platform to find out about on-going and recent research related to acrylamide in food. 2012 - EFSA received a proposal from organisations belonging to four EU Member States (Denmark, France, Germany and Sweden) to consider new scientific findings on the possible carcinogenicity of acrylamide. 2009-2012 – EFSA published four consecutive reports on acrylamide levels in food, comparing data from 2007 to 2010 over the series. The reports generally did not reveal any considerable differences from previous years in the levels of acrylamide in most food categories assessed. In the 2011 edition, EFSA also estimated consumer exposure for the different age groups, which were comparable with those previously reported for European countries. 2008 - EFSA hosted scientists from across the globe to discuss acrylamide in food toxicity and dietary exposure at its Scientific Colloquium 11: “Acrylamide carcinogenicity - New evidence in relation to dietary exposure”. 2005 - EFSA published a statement on acrylamide in food, agreeing with the principal conclusions and recommendations of the United Nations Joint FAO/WHO Expert Committee on Food Additives (JECFA) that dietary exposure levels to acrylamide may indicate a human health concern. EFSA provides independent scientific advice to risk managers on acrylamide in food. EFSA’s comprehensive assessment of the risks to public health from acrylamide in food was published in 2015. This work allows EU decision-makers to take account of the latest scientific findings in managing possible risks associated with the presence of acrylamide in food. EFSA also compiles data on acrylamide levels in a range of foods across Europe. Data submitted by Member States are assessed and, previously, have been compiled into annual reports. EFSA’s work helps identify trends in acrylamide levels over time and to estimate consumer exposure to this contaminant. In 2002, the European Commission’s former Scientific Committee on Food (SCF) published a scientific opinion on new findings related to the presence of acrylamide in food. The SCF concluded that there was insufficient information available at that time to determine the actual risk from exposure to acrylamide in food. In 2005, an EFSA statement noted that there may be a potential health concern with acrylamide which is known to be both carcinogenic and genotoxic in test animals. The statement endorsed the conclusions and recommendations of a previous risk assessment on acrylamide carried out by the Joint FAO/WHO Expert Committee on Food Additives (JECFA). In this assessment, JECFA concluded that acrylamide may indicate a human health concern and that efforts should be made to reduce exposure. Following a recommendation from the European Commission in 2007, Member States were requested to perform a three-year monitoring of acrylamide levels and submit data to EFSA. In 2010, the Commission recommended that Member States should continue annual monitoring. Since 2011, Member States are recommended to carry out investigations in cases where the levels of acrylamide in food exceed the prescribed indicative values. Acrylamide is a chemical that naturally forms in starchy food products during everyday high-temperature cooking. It is likely that acrylamide has been present in food since cooking began. It mainly forms from sugars and amino acids (mainly one called asparagine) that are naturally present in many foods. The chemical reaction that causes this is known as the Maillard Reaction. This is the same chemical reaction that ‘browns’ food and affects its taste. Acrylamide also has widespread industrial non-food uses and is present in tobacco smoke. 2. What is meant by ‘high-temperature cooking’? Typically, this means cooking at temperatures above 120°C with low moisture, including frying, baking and roasting, and also processing by industry. While this applies to commercial food preparation, including catering and food manufacturing, EFSA’s opinion states clearly that home-cooking choices can have a substantial impact on the level of acrylamide humans are exposed to through the diet. 3. Which foods contain acrylamide? Fried potato products (including French fries, croquettes and roasted potatoes) and coffee/coffee substitutes are the most important dietary source of acrylamide for adults, followed by soft bread, biscuits, crackers and crisp breads. For most children, fried potato products account for up to half of all dietary exposure to acrylamide with soft bread, breakfast cereals, biscuits, crackers and crisp breads amongst the other contributors. Baby food (mainly rusks and biscuits) is the most important source for infants. Some other food categories such as potato crisps and snacks contain relatively high levels of acrylamide but their overall contribution to dietary exposure is more limited (based on a normal/varied diet). 4. Are consumers at risk of developing cancer from acrylamide in food? Currently, studies on human subjects have provided limited and inconsistent evidence of increased risk of developing cancer. However, studies on laboratory animals have shown that exposure to acrylamide through the diet increased the likelihood of developing gene mutations and tumours in various organs. Based on these animal studies, EFSA’s experts agree with previous evaluations that acrylamide in food potentially increases the risk of developing cancer for consumers in all age groups. While this applies to all consumers, on a body weight basis, children are the most exposed age group. 5. What happens to acrylamide in the body? Acrylamide consumed orally is absorbed from the gastrointestinal tract, distributed to all organs and extensively metabolised. Glycidamide is one of the main metabolites from this process, and is the most likely cause of the gene mutations and tumours seen in animals. 6. Are there other health risks besides cancer? EFSA’s experts have considered possible harmful effects of acrylamide on the nervous system, pre- and post-natal development and on male reproduction. These effects were not considered to be a concern, based on current levels of dietary exposure. 7. How can acrylamide levels in food be reduced? Although not the focus of its risk assessment, EFSA’s 2015 scientific opinion includes an overview of data and literature summarising how the choice of ingredients, the storage method and the temperature at which food is cooked can influence the amount of acrylamide in different food types and, therefore, the level of dietary exposure. Soaking potato slices in water or citric acid solution can reduce acrylamide levels in crisps by up to 40% or 75%, respectively. Temperature generally increases acrylamide levels in French fries more than cooking time; frying above 175°C can lead to greatly increased levels. Toasting bread for five minutes instead of three minutes can increase the acrylamide content from 31µg/kg up to 118µg/kg, depending on the bread type and temperature of the toaster. Consumption of well-toasted bread, however, only increases overall average dietary exposure by 2.4%. 8. What can consumers do to reduce the risk from acrylamide in food? First and foremost, consumers should look for the latest recommendations provided by their national food safety authorities as they tailor food safety advice to national eating habits and culinary traditions. Generally, since it is practically impossible to eliminate acrylamide entirely from the diet, most public advice for the consumer aims at more selective home cooking habits and more variety in the diet. Since acrylamide levels are directly related to the browning of these foods, some countries recommend to consumers: “Don’t burn it, lightly brown it”. Varying cooking practices and finding a better balance, e.g. boiling, steaming, sautéing as well as frying or roasting, could also help reduce overall consumer exposure. A balanced diet generally reduces the risk of exposure to potential food risks. Balancing the diet with a wider variety of foods, e.g. meat, fish, vegetables, fruit as well as the starchy foods that can contain acrylamide, could help consumers to reduce their acrylamide intake. 9. Can the food industry help? One European food industry organisation (FoodDrinkEurope, also a member of EFSA’s Stakeholder Consultative Platform), in close co-operation with the national authorities and the European Commission, developed a “toolbox” to highlight ways to lower levels of acrylamide in manufactured food. Short extracts of the toolbox have been developed in the form of sector specific brochures. These brochures are designed to help food business operators to implement those items of the "toolbox" that are relevant for their sector. These brochures are available in 24 European languages. 9. Are public authorities doing anything to reduce the risk? European and national decision-makers will use EFSA’s scientific advice, once finalised, as well as other considerations in weighing up any possible measures to further reduce consumer exposure to this substance in food. These may include, for example, additional advice or specific campaigns to consumers on eating habits and home-cooking, or controls on commercial food production; however, EFSA has no direct role in deciding such measures. Currently, EU Member States monitor acrylamide levels in food and submit data to EFSA. The European Commission recommends that Member States carry out investigations in cases where the levels of acrylamide in food exceed so-called ‘indicative values’ set by the Commission as a guide. 10. Are public authorities doing anything to reduce the risk? Currently, EU Member States monitor acrylamide levels in food and submit data to EFSA. The European Commission recommends that Member States carry out investigations in cases where the levels of acrylamide in food exceed so-called ‘indicative values’ set by the Commission. 11. What is EFSA’s role? EFSA’s role is to carry out scientific risk assessments and give scientific advice on potential risks in the food chain. In the area of contaminants in food, this work is carried out by independent scientific experts belonging to EFSA’s Scientific Panel on Contaminants in the Food Chain (CONTAM Panel). The Authority also collects data on the levels of contaminants in food and supports the coordination of data collection and monitoring by Member States. The scientific advice, data and technical assistance provided by EFSA supports risk managers in making informed choices about regulating and controlling the food chain. 12. Does EFSA make food safety policies or regulate food manufacturing? No. EFSA has no direct role in deciding European or national measures aimed at reducing consumer exposure to acrylamide. These tasks are the responsibility of risk managers in the European Commission, European Parliament and Member States. 13. How open has EFSA been in developing this draft? Openness and transparency are key values for EFSA; the Authority has sought to involve Member States, the scientific community, civil society organisations and other stakeholders at various stages throughout the development of its opinion on acrylamide in food. In April 2013, EFSA launched a call to food business operators and other stakeholders to submit additional occurrence data on acrylamide levels in foods and beverages collected from 2010 onwards. The Authority also consulted consumer organisations, NGOs and the food industry through its Stakeholder Consultative Platform to find out about ongoing and recent research related to acrylamide in food. From 1 July to 15 September 2014, EFSA held an online public consultation on its draft scientific opinion to allow scientists, national authorities, stakeholders and other interested parties to comment on the approach, information used and draft conclusions of EFSA’s draft scientific opinion. Before finalising the opinion, EFSA’s scientific experts discussed this feedback together with the contributors to the online public consultation at a public meeting held December 2014. This process helped EFSA’s experts to fine-tune their scientific opinion and integrate recent studies (up to March 2015) into the final scientific opinion.